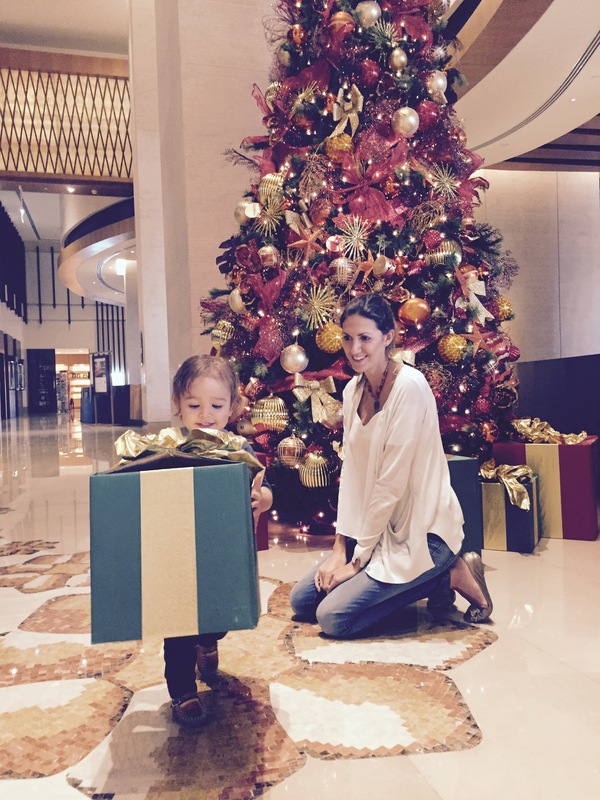 We had a wonderful festive afternoon on Friday brunching at the Al Ghurair Rayhaan ‘Waiting For Santa Brunch’. While we’re big fans of the Rotana chain of hotels, we had never ventured as far as Al Ghurair Rayhaan, which is located in the heart of Deira. 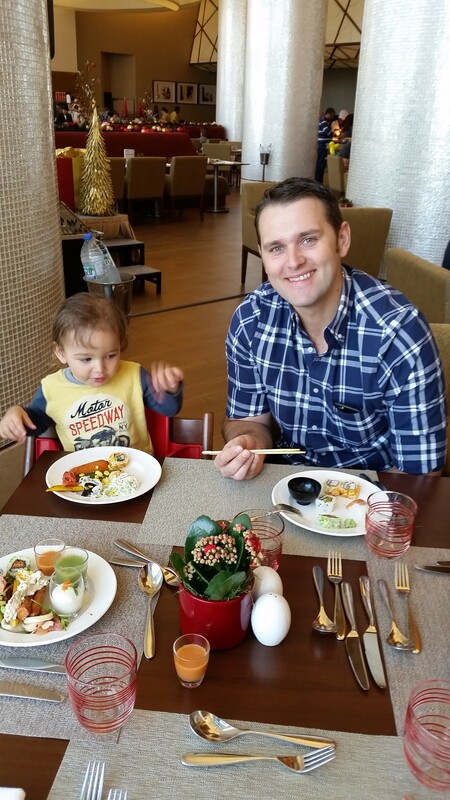 A bit unsure of our location at first (as I basically class anywhere past Mall Of The Emirates outside of my comfort bubble), we found ourselves in a plush, newly built hotel with friendly staff who kindly directed us to Liwan Restaurant where the brunch was being hosted. The restaurant itself was large and modern, with high ceilings and a spacious set-up. As a family-friendly brunch, there was also an area specifically for kiddies kitted out with soft play mats, a bouncy castle, a TV playing films, and a finger food stand which consisted of nuggets, popcorn and chips. As both the hubbie and I were starving, we decided to check out the food first before unleashing Zachy into the kiddie area. The starters was a delightful mix of nibbles such as sushi, Arabic mezze, salads, and grilled veggies which Zachy devoured, while Indian and Italian cooking stations offered a mix of cuisine for mains suited to everyone’s liking. But let’s not forget the main event – the Christmas buffet! A succulent turkey cooked to perfection was served up alongside stuffing, steamed and roasted veggies, along with the scrummiest roast potatoes. 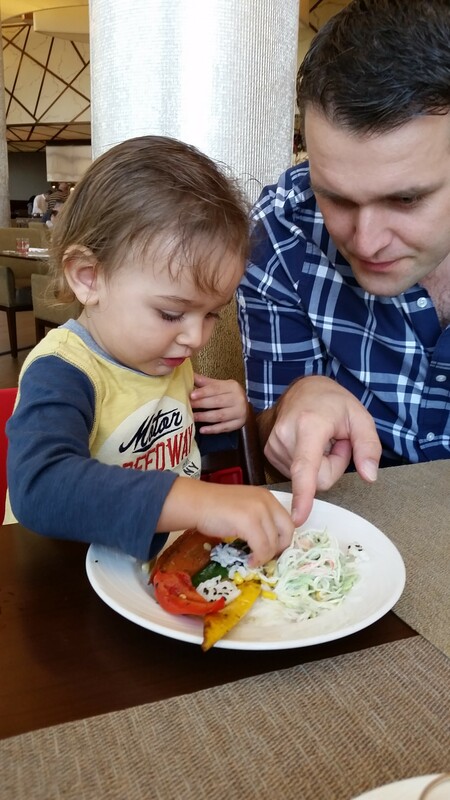 Zachy, whose favourite food in the whole world is “cheee-en” (chicken) finished his plate of turkey within minutes before brazenly tucking into mine, and then his father’s plate – an all-round success on the baby-led weaning front I’d say! Feeling rather stuffed, we had a short break from eating, upon which we were delighted by a visit from Santa Claus! 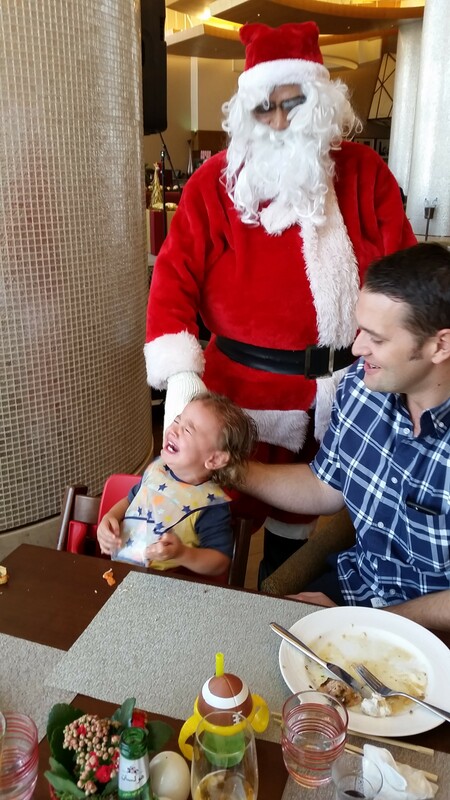 Now, this was the first time Zachy had had the opportunity to meet Mr Claus’s acquaintance, least to say my husband and I were a little excited! However the first meeting did not go down quite as well as I had imagined, with it taking about all of two seconds before tears! Maybe next time hey, little fella? After sufficient Santa traumatization, something surprising happened whereby a troupe of ‘Santa’s Elves’ came out to sing us all festive tunes. 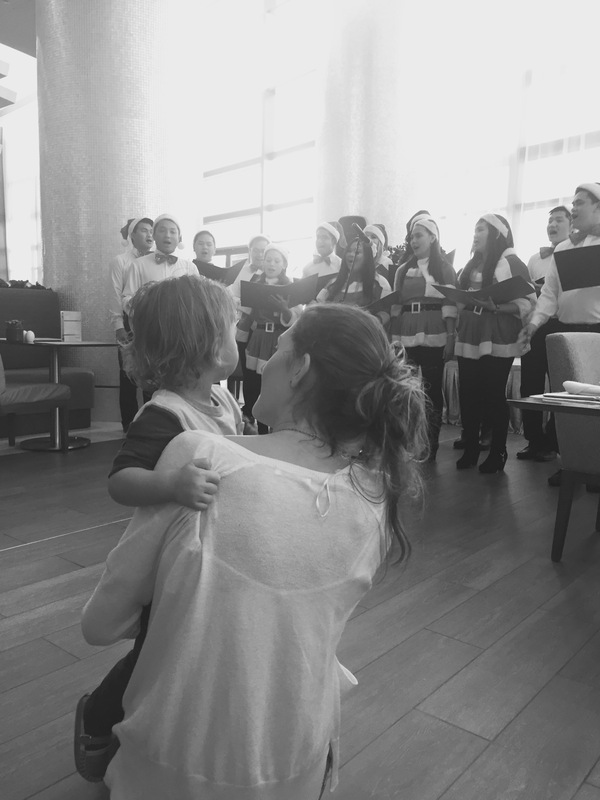 The ‘Elves’ were actually Al Ghurair Rayhaan staff, which made the whole thing feel very heartwarming and authentic, as they were clearly having a great time making everyone smile. Zachy had a little jig, but I think he was a bit on edge keeping an eye out for the big guy in the red suit as we were not treated to his classic all-out baby boogie. Following that, I had a taste for chocolate so went over and more or less devoured the dessert stand. I think I ate about three slices of cheesecake and also asked my husband to fill a bowl with melted chocolate from the chocolate fountain…it was really quite shameful, but meh, its Christmas! My husband enjoyed his favourite desert, Umm Ali, while also stealing some of my cheesecake. By this point we were heading towards a food coma, and Zachy was well into a sugar high, so I took him for a little play in the kiddie’s area to give Dad a rest. Slightly concerned that the food and the excitement would get the better of him, we stuck to the cuddly teddy section instead of having an all-out jump on the bouncy castle. He was clearly ready for a nap though, so we decided to scrub up and head home, happy from a lovely afternoon of yummy food, great service, and festive fun! The brunch was priced as AED 165 per person (alcohol not included) and was set at half price for children between 5-12 years. 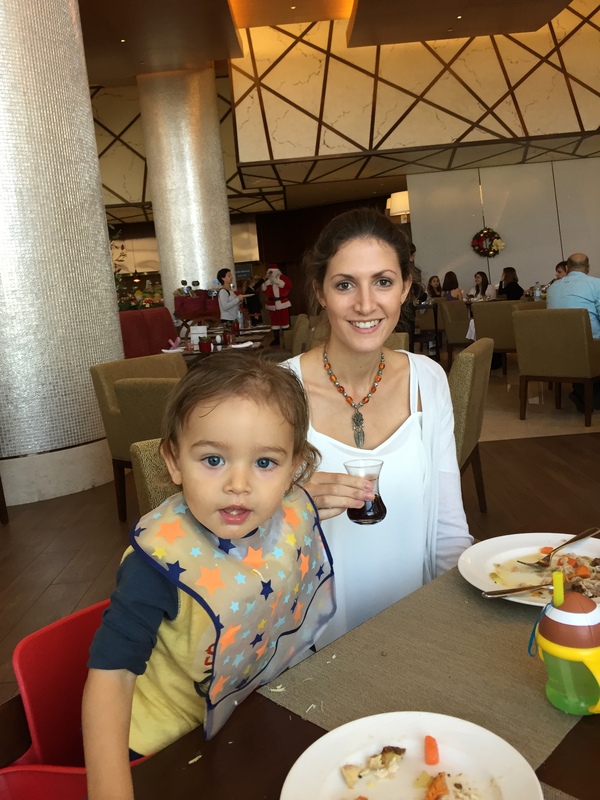 This was the last in the series of the Waiting For Santa Brunches, which took place every Friday through December, but Al Ghurair Rayhaan is also offering up an indulgent Christmas dinner and brunch buffet for the same price (AED 165) between December 24, 25, 26.